Iran’s influential parliament speaker dismissed allegations that post-election detainees were raped while in custody, calling the claims by an opposition leader "sheer lies," state-run media reported Wednesday. The treatment of detainees at Iran’s prisons has increasingly become a divisive issue within Iran’s Islamic leadership, as reformists continue to accuse the hardline government of allowing of abuse and torture in attempts to coerce false confessions. Opposition figures such as Karrubi have compared the treatment of detainees now to political prisoners abused under the “oppressing regime” of the Shah of Iran, who was overthrown by the Islamic Revolution in 1979. “I don’t think that in the 15 years, leading up to the victory of the revolution, individuals from the communists, armed resistance, liberation front and the Islamic party — who were all imprisoned and living together in prison — had ever heard of or seen such things,” Karrubi said. Larijani on Wednesday challenged Karrubi to “present evidence of such outrages” for the Majlis to investigate, according to Press TV. Iranian media has reported that Ayatollah Ali Khamenei, Iran’s supreme leader, has ordered one prison, Kahrizak, shut down amid reports it did not measure up to the required standards. Kahrizak’s chief was fired and arrested over allegations of detainee mistreatment, according to local reports Saturday. A special parliamentary committee has made rounds at Tehran’s Evin prison, but did not find any signs of abuse, according to recent media reports. Hundreds of detainees have since been reportedly released from Evin, though “political figures” were held and put on trial. 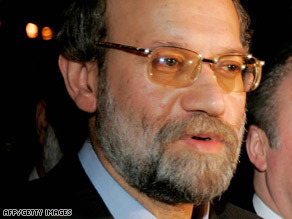 A spokesman for Iran’s Foreign Ministry Monday denied that prisoners had been tortured. “What kind of talk is this There was never any pressure used against these people,” Hassan Qashqavi said, according to the semi-official Mehr news agency.